Germany’s Heimdalls Wacht are a fairly new pagan black metal act, although in their four years of existence they have already released three reasonably acclaimed full-length albums. “Der Untergang der Alten Welt” was the second of these, a long yet engaging release which was unleashed by Christhunt Productions in 2006. Much of “Der Untergang” is characterised by driving riffs which can be noisy and cold, as on “Die Tranen des Alten Wachters”, but also contain a good deal of melody and feeling. 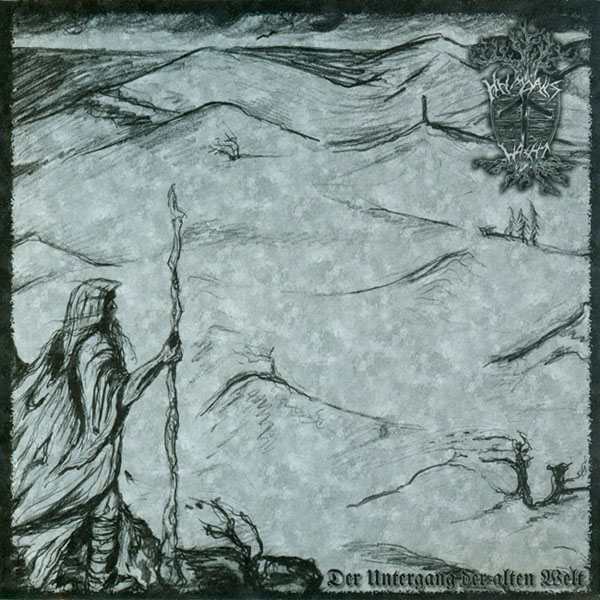 The pace switches ably from the rousing thunder of “Unter dem Banner der Weissen Hand” to the more majestic, mid-paced epic feel of central tracks such as “In Kalten Schatten Versunken” and “Der Letzte Marsch”. Vocalist Narhemoth for the main part employs a howling shriek which combines well with the raw production and reverbed guitar tones. Heimdalls Wacht’s interest in the past (the album title translating as ‘the fall of the old world’) manifests in a pervasive mournful tone, which is present in many of the black metal melodies, but even more strongly in the clean breaks which punctuate many of the songs, beginning with the distinctly sad clean vocals on “Des Nordens Stern”. This reaches a peak on fifteen-minute monster “Weltenbrand”, with its nature effects, ringing, warm tone and epic structure and riff-writing. “Weisses Pferd auf Rotem Grund” and “Ein Denkmal fur die Alte Welt” finish the album with a flash of hope after the nostalgic gloom of the early tracks, with the former offering rousing, clean group vocals with a power metal feel over a grooving riff, and the latter featuring a solo in the major key, reminiscent of fellow countrymen Trimonium.